OBJECTIVES: To determine: (i) the national status of newborn hearing screening services in the private health care sector of South Africa; (ii) screening approaches implemented; and (iii) challenges to screening implementation. DESIGN: A descriptive quantitative national survey was conducted in the private sector of South Africa. 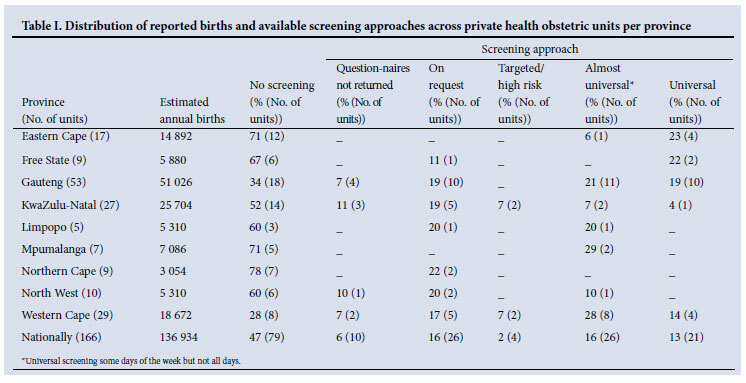 METHOD: All private health sector institutions with obstetric units (N=166) were surveyed telephonically and self-administered questionnaires were subsequently sent to all audiologists in private practice (N=87) who provide newborn hearing screening services at the units with hearing screening. RESULTS: Nationally 53% of private sector obstetric units offer some form of newborn hearing screening. 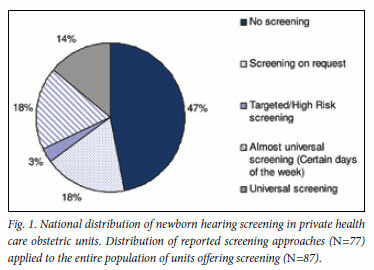 Universal hearing screening was only offered by 14% of units, while the most common approaches were universal screening on some days of the week (18%) and screening on request (18%). The most prominent challenge to successful screening implementation was the omission of newborn hearing screening from maternity birthing packages at the health care institutions. CONCLUSION: The vast majority of newborns nationally are not screened for hearing loss, and existing programmes are not sufficiently systematic and integrated to ensure adequate coverage. Hospital management and paediatric health services must prioritise hearing screening as part of standard of care in birthing services. EHDI services for optimal outcomes are recommended to identify children with hearing loss before 1 month of age, to complete diagnostic assessments before 3 months of age, and to initiate intervention (amplification and language-based intervention) before 6 months of age.4-7 This can only be attained if the very first step, newborn hearing screening, is systematically employed and followed up appropriately.2,3 The current study conducted a national survey on the status of EHDI services in the private health care sector of South Africa. A survey was conducted nationally in the private health care sector across all provinces of South Africa. The total population included all private health care hospitals or clinics that offer obstetric services and the audiologists in private practice (registered with the Health Professions Council of South Africa) who provide infant hearing screening services at these units. Ethical clearance was obtained before commencing the study. All private health sector (non-government-funded) institutions in South Africa listed on www.medpages.co.za (2009) were contacted telephonically in order to determine whether the respective institution rendered obstetric services.13 There were 304 such institutions, including hospitals, clinics and private practices, listed for potential inclusion in the sample.13 After removing duplicated listings, 298 hospitals were contacted. Eight of these were not applicable to the current study because they were partially government funded and therefore not private sector institutions. Another three hospitals or clinics no longer existed as functioning private institutions, and one could not be reached after numerous calls to all documented numbers in the national telephone register. All maternity and/or neonatal wards at those institutions that rendered obstetric services were surveyed, and questionnaires were subsequently sent to the audiologists who conducted hearing screening at the respective private sector institutions with hearing screening services. Participants who worked at more than one private institution were asked to complete one questionnaire per institution to ensure that data were representative for each respective hospital or clinic. The survey aimed: (i) to determine the estimated number of births at each institution; (ii) to find out whether newborn or infant hearing screening services were rendered; (iii) if hearing screening was offered, to find out what the nature of the service was (i.e. universal, parental or paediatrician request only, targeted or high-risk screening) and (iv) to identify the most significant challenges towards implementation of newborn hearing screening programmes. A self-administered questionnaire was sent out by e-mail or fax. The questionnaire consisted of several sections. The first section surveyed biographical information and the second information on work context and hearing screening practices. Subsequent sections covered data management and quality control, diagnostic protocols and intervention services and are not reported here. Data collected from the telephonic survey with private hospitals and subsequent maternity wards were integrated with data collected from the questionnaire completed by audiologists at the specific institutions. The data were analysed to yield percentages and frequency distributions nationally and across provinces. Of the 286 eligible private health care institutions, 120 (42%) did not render obstetric services. The remaining 166 institutions with obstetric units were surveyed, and 53% (87/166) reported some form of newborn hearing screening service. Questionnaires were subsequently sent to audiologists managing the screening programmes at these institutions to ascertain the nature of the services. A return rate of 89% (77/87) was achieved. Reported estimates by the private health care institutions with obstetric units indicated that approximately 136 934 babies were born each year across these units in South Africa. Audiologists managing hearing screening at the units (87/166) were asked to indicate the number of babies screened monthly at the respective institutions. Reportedly, an estimated 39 564 babies are screened annually (3 297 per month) at the institutions for which responses were obtained (N=70). Compared with the reported number of estimated births at all private institutions with obstetric units, at least 29% of newborns born at private health care institutions are screened for hearing loss. Seven (9%) of the respondents did not complete this question because regular statistics of screenings were not documented. Table I provides a breakdown of the estimated number of births and the reported availability and nature of newborn hearing screening services. The highest screening coverage was in the Western Cape and Gauteng provinces, where 72% and 66% of obstetric units respectively offered some form of hearing screening. In the Eastern Cape, the Free State, Mpumalanga and the Northern Cape, more than two-thirds of obstetric units do not offer any form of hearing screening. 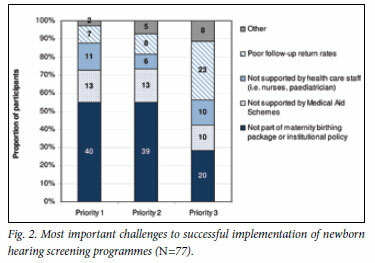 The three most important perceived challenges to successful implementation of newborn hearing screening in the private health care sector were prioritised by participants as illustrated in Fig. 2. Most prominently prioritised as the first (40%) and second (39%) most significant challenge was the apparent omission of newborn hearing screening from maternity birthing packages and institutional policy at the health care institutions. The small percentage of challenges listed under 'other' related mainly to test environment and procedural issues. This survey was the first to report the national status of newborn hearing screening services in the private health care sector of South Africa, which serves approximately 15% of the population.11 A similar survey in the public health sector of South Africa indicated that 7.5% of public birthing hospitals provide some form of newborn hearing screening and less than 1% offer universal newborn hearing screening.12 Screening in the private sector is more comprehensive, with 53% institutions with obstetric units offering some form of newborn hearing screening but only 14% offering true universal hearing screening. Being born in a unit that offers screening does not guarantee that a baby will be screened, since parents must indicate whether they agree to the service. Hearing screening is not included as an integrated part of maternity birthing services and is not covered by all medical aid schemes. The best practice recommendation for newborn hearing screening programmes is universal screening with coverage exceeding 95%.4,5,7 The current study demonstrates coverage rates for hearing screening in the private health sector that are significantly less than 50%. The most frequently reported challenge to successful implementation of hearing screening in the private health care sector was the omission of newborn hearing screening from maternity birthing packages and institutional policy. As a result newborn hearing screening is not implemented or monitored systematically, but is dependent on individual initiatives without being an integrated part of routine neonatal care.2,8 Hospital management and paediatric services must prioritise hearing screening to include newborn screening as part of the birthing package services as opposed to being an optional extra, if available at all. Other secondary challenges to address include improving awareness among health care personnel regarding the importance of early identification and the comprehensive reimbursement of hearing screening services by medical aid schemes. All children with hearing loss have the basic human right of access to human communication.14 The overwhelming majority of babies with hearing loss in South Africa will not be screened at birth, which leads to late identification and restricted developmental outcomes. Current screening programmes in private health care are not sufficiently systematic and integrated with birthing services to ensure adequate coverage. The successful implementation of these programmes is the first step towards optimal outcomes for affected individuals and lifelong savings for the family and the economy.1,2,4,7,8,9 Achieving this goal requires support from health care management and neonatal health providers. 13. Medpages (online): South African Health professionals directory. http://www.medpages.co.za/index.php?module=products&category=directory (accessed 30 August 2009).